http://www.JewishWorldReview.com | The Supreme Court's recent decision in the Arizona immigration case settled the debate over whether states may criminalize violations of federal immigration law (they may not) or require local police to check the immigration status of detainees they suspect of being in the country illegally (they may). But the ruling in Arizona v. United States did nothing at all to fix America's dysfunctional immigration system or clarify what to do about illegal immigrants. Neither did President Obama's announcement a few days earlier that most young illegals who were brought to the United States as children will be allowed to remain in the country without fear of deportation. Nor, for that matter, did the aggressive deportation activity that preceded it, which saw the Obama administration expel nearly 1.2 million illegal immigrants in three years, more than any president since the 1950s. For all the storm and stress of our national immigration debate, there has been remarkably little inclination to go beyond treating symptoms. Prescriptions range from the Dream Act that would make citizenship an option for hundreds of thousands of young illegals to the hard-line approach of those who want to make it so difficult for undocumented immigrants to get work that they will "self-deport." 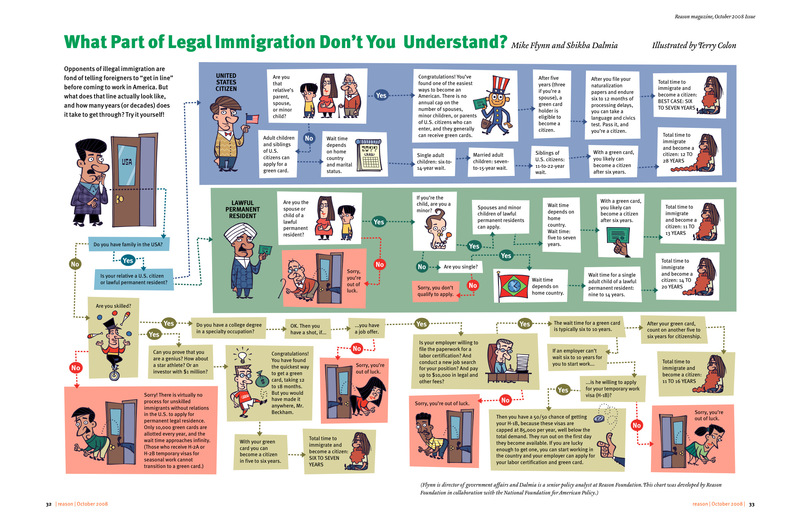 But the basic architecture of US immigration policy itself -- with its strangulating confusion of quotas and regulations, and its core assumption that immigration must be strictly limited and regulated -- nearly always goes unchallenged. It shouldn't. For the problem with America's immigration system isn't that too many people are breaking the rules. It's that the rules themselves are irrational, illiberal, and counterproductive. Our national immigration policy seeks to control the number of migrants entering the United States, dictate which parts of the world they should come from, specify how closely they must be related to current American residents, and stipulate the kinds of jobs they are eligible to work. Exactly 226,000 green cards, for example, are available each year for what federal regulations classify as "family preference" immigrants. Within that category, there are precise sub-quotas, such as the 23,400 green cards reserved for married sons and daughters of US citizens, or the 65,000 green cards for the siblings of citizens. Employment-based green cards are even harder to come by. Only 140,000 are authorized per year; they too are divided into sub-quotas. In addition, no more than 7 percent of the total can be issued to immigrants from any single country. Byzantine in its intricacy, unrelated to real-world pressures of supply and demand, America's immigration policy inevitably results in huge backlogs. Some would-be immigrants must wait in line for decades to get a green card. For many others, there is no line to wait in. The result, not surprisingly, is a powerful incentive to enter illegally. Quotas and preferences have been basic features of our immigration policy for most of the past century. By now a majority of Americans may find it hard to imagine that a radically different approach might make more sense. Yet for most of US history, the government's approach was radically different. Immigration was largely unrestricted. Most peaceful foreigners were free to move to the United States. Certain categories of individuals might be excluded by law, but only because they were deemed genuinely undesirable -- for instance, those suffering from a "loathsome or a dangerous contagious disease." Apart from the disgraceful and racist Chinese Exclusion Act of 1882, it wasn't until the 1920s that Congress began imposing broad arbitrary limits on the number of people who could come to America, or the countries they could come from. Driven by a nativist backlash to what had been the greatest wave of immigration in American history, Congress for the first time created the quotas that are now so entrenched in US immigration policy. Economically, such quotas are indefensible -- lowering immigration barriers is one of the most pro-growth measures any country can adopt. But our current quota-based system is politically harmful as well. Thanks to its capricious restrictions, immigrants are deemed "illegal" not because they are objectively unsuited to be Americans, but because they don't fit within a random numerical cap. What's worse, those very restrictions create the distortions that induce so many industrious immigrants to cross the border unlawfully. That in turn generates the anger and suspicion that have made our immigration debates so rancorous. We have other options. We could scale back existing family and country preferences and scale up a lottery for immigrant visas. We could, as Nobel economist Gary Becker and others have suggested, sell green cards at set rates with no ceiling on the number of slots available. Though it seems politically impossible now, we could even return to open borders with common-sense exclusions. The point is that US immigration policy needs a rethink more fundamental than the usual four corners of the debate. Nowhere is it carved in granite that immigration must be governed through quotas. America's immigration policy wasn't this dysfunctional in the past. The quota system is an old mistake, but it doesn't have to be our future.